This summer, why not get off the couch and get into shape in preparation to compete in Italy? Italy is hosting the 2005 Junior World Championships and if you made the US junior team you are invited to go. The purpose of this trip is to train hard and race well but you will also be able to kayak the streets of Venice and hike the snow-capped Alps. Our journey take us to Trento, Italy located just north of the halfway point between Venice and Milan. There, we will attack the Noche River. The river difficulty is class 3. It is harder than the Nantahala and easier than the Ocoee. I advise practice on your river roll and racing composite boats only if you really feel comfortable doing so. Shaun Smith - Manager/Coach. 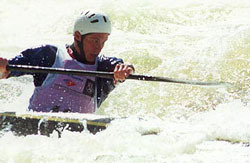 Shaun represented the US in the 2005 World Championships held in Germany. Shaun holds a degree in Physical Education and was coach/co-director of the City of Chattanooga’s Rapid Learning whitewater youth program for 3 years. Maurizio Tognacci – Coach. Maurizio is the Italian Master Wildwater K-1 Champion, Former Italian National team member, and Italian Federation certified Canoe/Kayak coach. Maurizio will be helping coach and manage the trip while in Europe. His passion for life and enthusiasm for kayaking will be a great addition to the trip. Dates: July 21 2005 – August 1 2005. July 21 - leave the U.S.
July 28 - (AM) Non stop race, (PM) Practice sprint course, 2-3-runs (the sprint course is the final part of the classic race) The finish line is the same for all races. August 1 - fly to the U.S.
Trip Costs: Flights will be made through Cathy King at Adventure Travel. You can contact her at (888) 850-9254 or via email at adventuretrips@hotmail.com. Please, do not purchase tickets until notified from Shaun Smith. The cost of the ticket will be around $1,000. We will be flying British Air. Hopefully there will be no boat charge if flying with your boat and “ONE” check on bag. Pricing is still being arranged for the rest of the trip. Contact Shaun Smith for more information. Supervision: This is not a party trip. We will be following the laws of the land! DO NOT come if you plan on not training hard and/or being trouble. We reserve the right to not allow athletes to race if their behavior is not honorable or appropriate. We represent the USA so plan on doing so in a respectable manner! The trip is completely supervised. Sign Up: Contact Shaun Smith and Chris Hipgrave. Contact information is below. What to Bring and Expect: There are some forms you must fill out for us, which will be given to you at a later time. You will also need a passport (send a copy of your passport to Shaun Smith). It can take time for passport papers to go through, so start right away if you don’t have one. Check with your doctor for any shots and immunizations that you may need or check www.cdc.gov/travel. The weather will be mild with cool nights. Check for your self. Make sure that your boat and life jacket are race legal before you go. Also it is advisable to have a long sleeve-paddling jacket. We will be traveling in small station wagons so PLEASE don’t over pack! Check out the web site at www.valdisole.it/valdisole/ing/Estate/torrente_noce.asp for move information on the area. For training: I suggest doing 45 minutes to an hour of endurance work a day (Monday, Tuesday, Wednesday) of any kind. That includes running biking, paddling on flat water or whatever you can think of. Then take Thursday off and paddle on the weekend in your wild water boat as much as possible on rivers. Contacts: Shaun Smith (parashaunte@hotmail.com, 423-322-7595) or Chris Hipgrave (hipgrave.chris@gmail.com).